Following the demise of The Prisoners, Graham Day and Allan Crockford joined forces with Wolf Howard and later Fay Hallam, to form The Prime Movers, a rockier more progressive sound including the 'Earth Church' LP, which was hailed by the now defunct Sounds Music Weekly as LP of the year. The chaps later returned to their famous garage sound with the formation of The Solar Flares, some truly great LPs and live shows followed, before most recently Graham went on to form Graham Day & The Gaolers and Allan Crockford is now leading the very wonderful The Galileo 7. 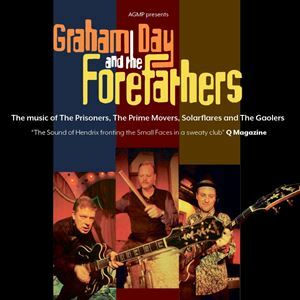 The new project, Graham Day & the Forefathers, featured Graham Day on Guitar / Vocals, Allan Crockford on Bass / Vocals and Wolf Howard on Drums. This project is focused on solely playing the music from the musician's past. Expect to hear 100% classics - all the songs you love, played by the people you love.